Stufurhome GM-Y01W 30.5-Inch Pure White Single Laundry Sink by Stufurhome at The Synthesizer. MPN: GM-Y01W. Hurry! Limited time offer. Offer valid only while supplies last. 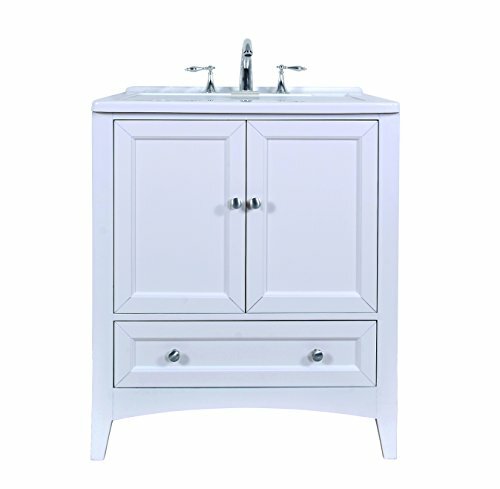 This all-in-one laundry single sink vanity, embellished in a pure white finish, is a masterful combination of simplicity, functionality and charm. This all-in-one laundry single sink vanity, embellished in a pure white finish, is a masterful combination of simplicity, functionality and charm. The deep rectangular sink, spacious storage and drawers definitely fulfill the needs of modern day living. The bright white of the sink and the pure white finish of the cabinet make this vanity an attention grabber and add a scent of gracefulness to your laundry room. Silkroad Exclusive Bathroom Vanity HYP-0722-T-UIC-72 Esther 72"